*Fees are payable upfront and are not refundable after the 14 days cooling-off period. This is the date for when the current displayed stocks were generated. A fresh stock list will be posted by 2.30 pm of every trading day. Click on either Bursa or SGX to see the Chartist Picks for Bursa Malaysia and the Singapore Exchange, respectively. Our proprietary algorithm picks out stocks that are enjoying sustained upward price trends. Anecdotal evidence suggests that past winners often continue to be future winners. A report card for our Chartist Picks summarised by the Month in which the stocks were picked and the Success Rate (%). If the share price is higher within 3 months of the stock being picked by our algorithm, we define it as “Success”. In 2015, an average of 2 stocks were picked every day and the success rate was more than 89%! The Fundamental and Valuation scores give you a quick overview of the company’s fundamental strength and attractiveness of prevailing valuations, calculated based on historical data. The Fundamental score reflects a company’s profitability and balance sheet strength. A score of 0 means weak fundamentals while a maximum score of 3 denotes strong fundamentals. Similarly, the Valuation score ranges from 0 to 3. A score of 0 means valuations are not attractive while a maximum score of 3 means valuations are attractive. For companies with insufficient data to calculate all of the required ratios, for instance new listings, the scores are displayed as “NA”. 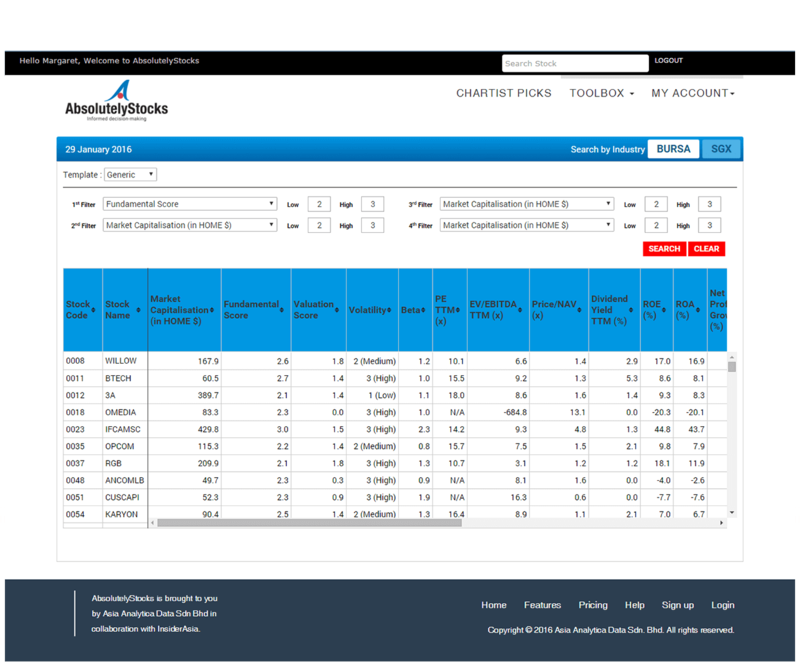 This table offers expanded details on the stocks that were generated in any selected month.  Currently, companies are categorised under 4 Templates based on their financial reporting formats. The templates are Bank, Insurance, REITs and Generic (for all other companies that do not fall into the first 3 categories). We offer you a range of filters to discover your own hidden gems on both Bursa Malaysia and the Singapore Exchange. You can Compare financial ratios for Multiple Stocks. Simply type in the stock code or stock name and click the Add button. To clear the results table and start a new search, click the Reset button. You can sort each ratio in ascending or descending order. Your selected companies will be displayed in the results table. 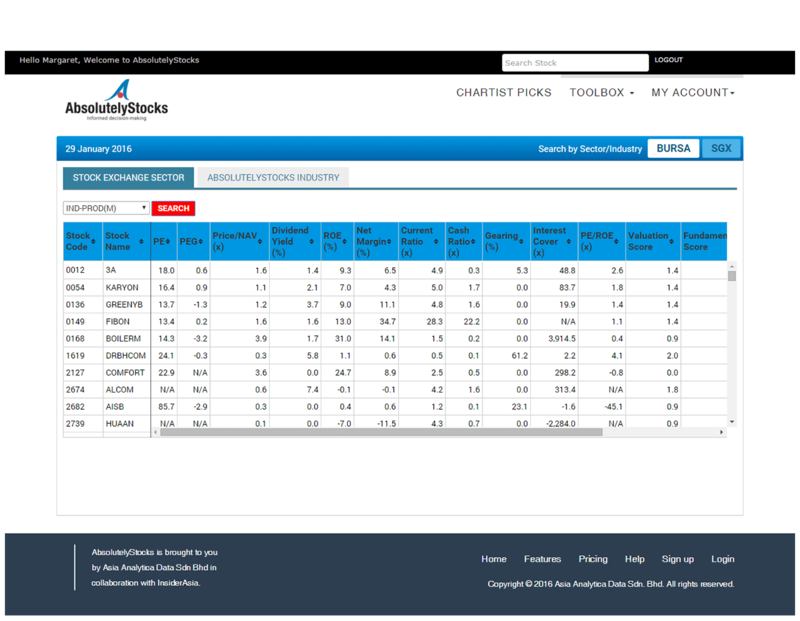 You can compare all of the stocks listed under a selected Sector as defined by the Stock Exchange. 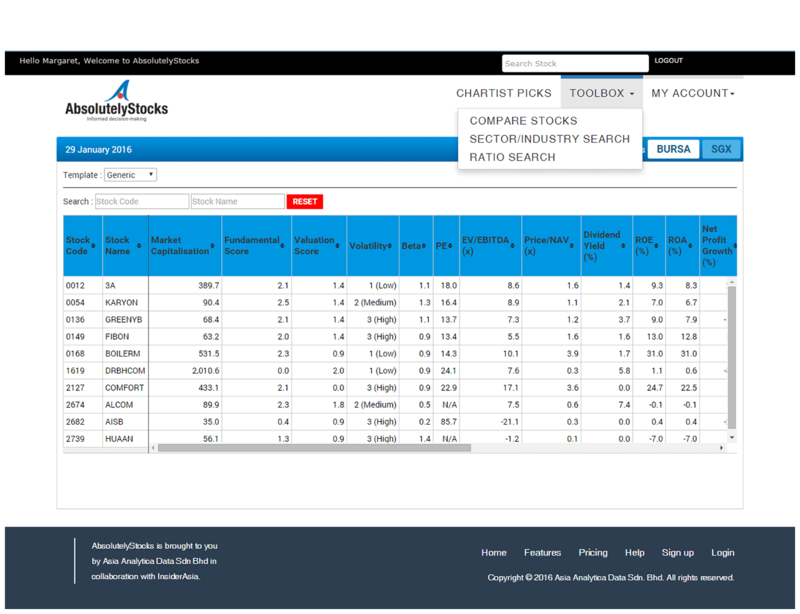 Or you can compare all of the stocks listed under Industry as defined by AbsolutelyStocks. Here, we categorised companies based on a more detailed description of their industries, so as to enable you to better compare companies with similar businesses. Simply select the Sector or Industry you wish from the drop down menu. All of the stocks listed under the selected Sector or Industry will be displayed in the results table. Choose a ratio and enter the range that you wish to filter the stocks by. Our drop down menu offers a selection of the most Useful of Ratios. You can select up to 4 ratios in one search. You can sort each ratio in the results table in ascending or descending order. Click on the Search button to view your results. To start a new search, simply click on the Clear button. All stocks meeting your selected search criteria will be displayed in the results table. Simply type in your company name and select from the drop down suggestions menu to start your Search. 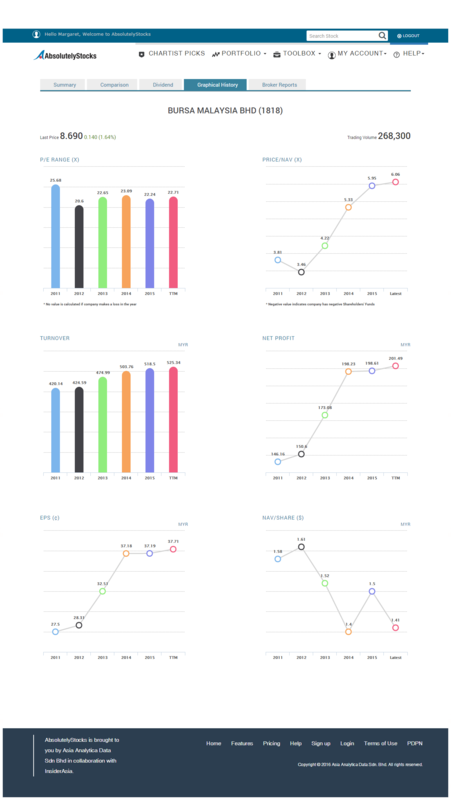 The Fundamental and Valuation scores give you a quick overview of the company's fundamental strength and attractiveness of prevailing valuations, calculated based on historical data. The Fundamental score reflects a company's profitability and balance sheet strength. A score of 0 means weak fundamentals while a maximum score of 3 denotes strong fundamentals. For companies with insufficient data to calculate all of the required ratios, for instance new listings, the scores are displayed as "NA". This reflects the Volatility of a company’s share price relative to the rest of the market, ranked from Low to Medium to High. Low means its share price has been relatively stable. High means its share price has fluctuated widely based on historical movements. This is an indicator of a company in a state that lends itself to corporate exercise (whether merger & acquisition, take-over or otherwise) based on our proprietary set of predefined criteria. Companies are categorized as having either High or Normal likelihood of corporate exercise. 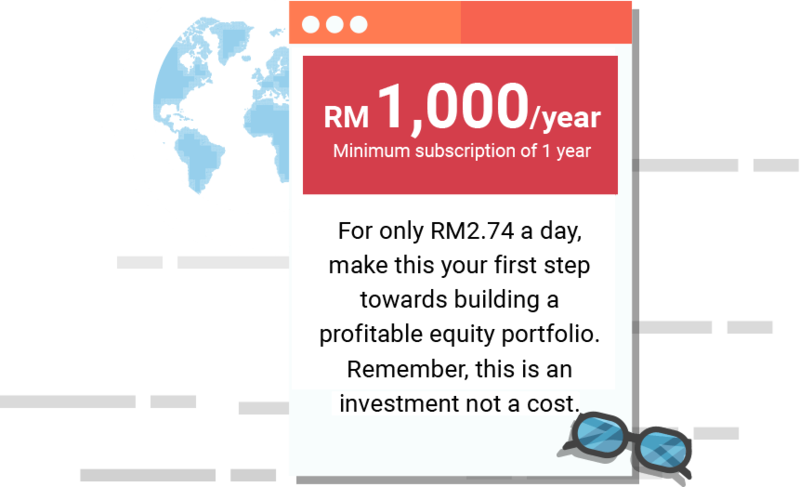 The Stock Beta measures the movements of your selected company’s share price against the market benchmark index, in this case either the FBM KLCI or the Straits Times Index (STI), over a period of time. A Beta < 1 means that its share price has been, historically, less volatile than the benchmark index, which is proxy for the broader market. A Beta > 1 indicates that its share price has been, historically, more volatile than the market. This section gives a brief description of the business for your selected company and other key facts such as current Market Capitalisation, Key Personalities and Substantial Shareholders. This is a table of some Key Ratios for your selected company. If available, we will display ratios for up to 3 financial years as well as that for the trailing 12-month period. 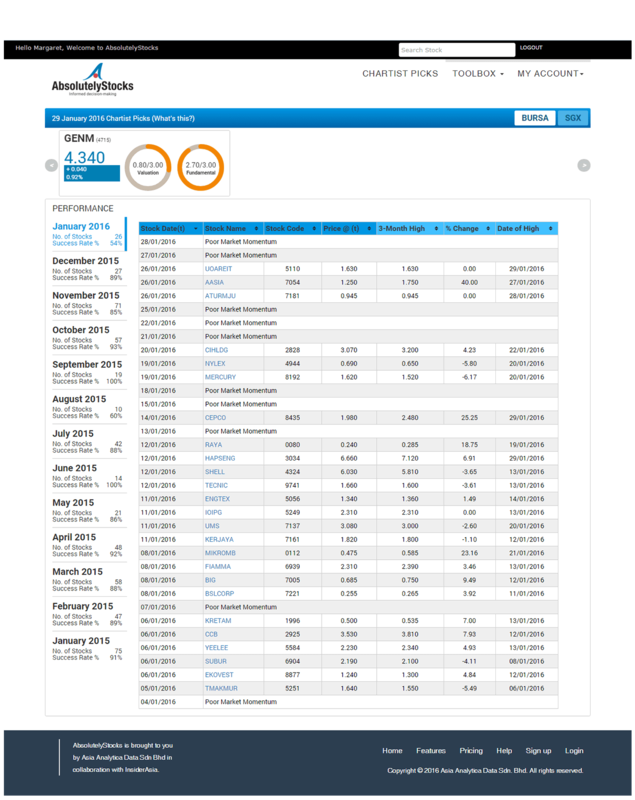 You can view a summary of the Income Statement, Cashflow and Balance Sheet for your selected company. If available, we will display data for up to 3 financial years as well as that for the latest reported quarter. This indicates the Currency in which your selected company’s financial statements are reported. You can compare the share price performance for up to 5 companies and for periods of up to 3 years against your selected company. Simply type in the name of a company, select from the drop down suggestions and click the Compare button. This is a table to compare select peer companies based on our proprietary Industry classifications. We display the top 3 companies by market capitalisation in the same Industry as your selected company as well as the 3 companies with the most similar market capitalisation in the same Industry as your selected company. 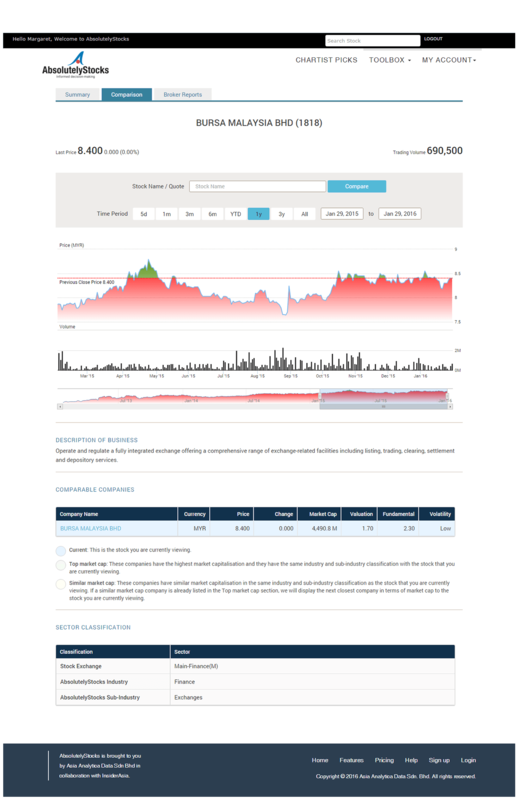 We display some Broker Reports for your selected company. 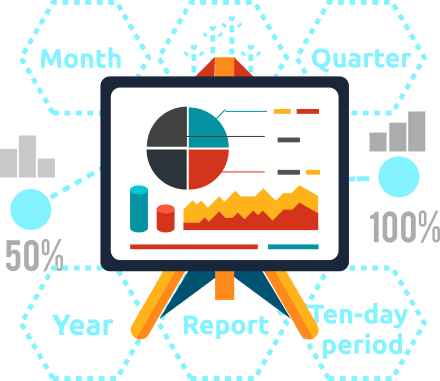 The reports are arranged by month of publication, name of the research house as well as the recommendation for the stock. Click on the research house to view the report. There is no other hidden fee. 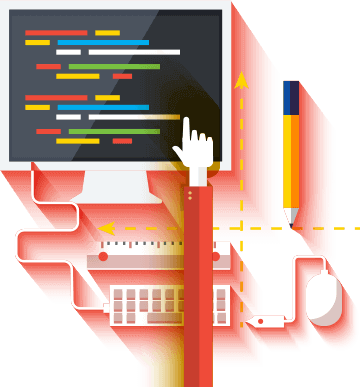 You will get full and complete access to all of the above-mentioned content with our standard package. The minimum subscription period is 1 year. Please include your Username if you are our existing member, so that we may spot you quicker from our system. 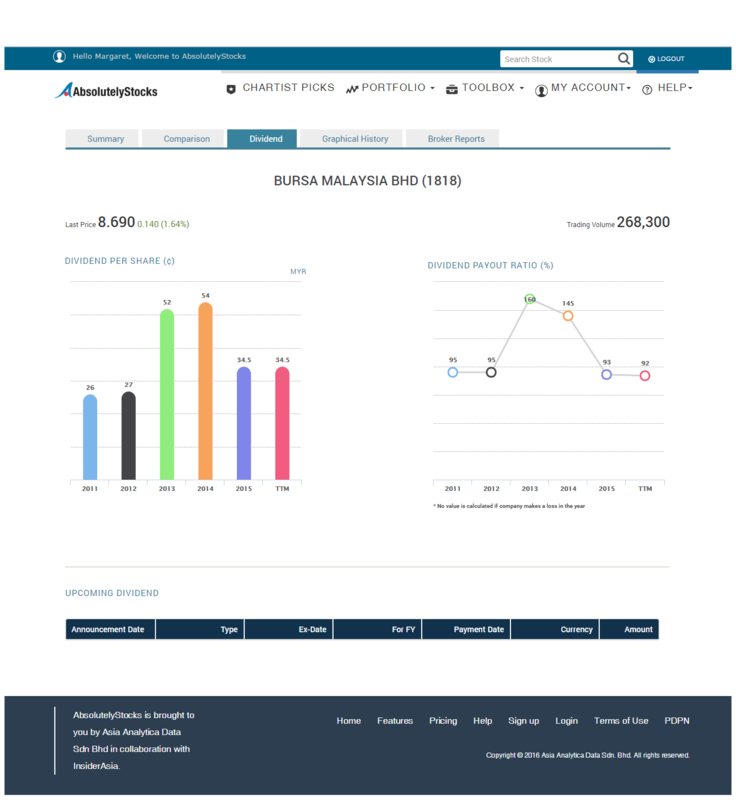 AbsolutelyStocks is brought to you by Asia Analytica Data Sdn Bhd in collaboration with InsiderAsia. It is our aim to provide easy to use financial information, analytics and tools to help you make better investing decisions. 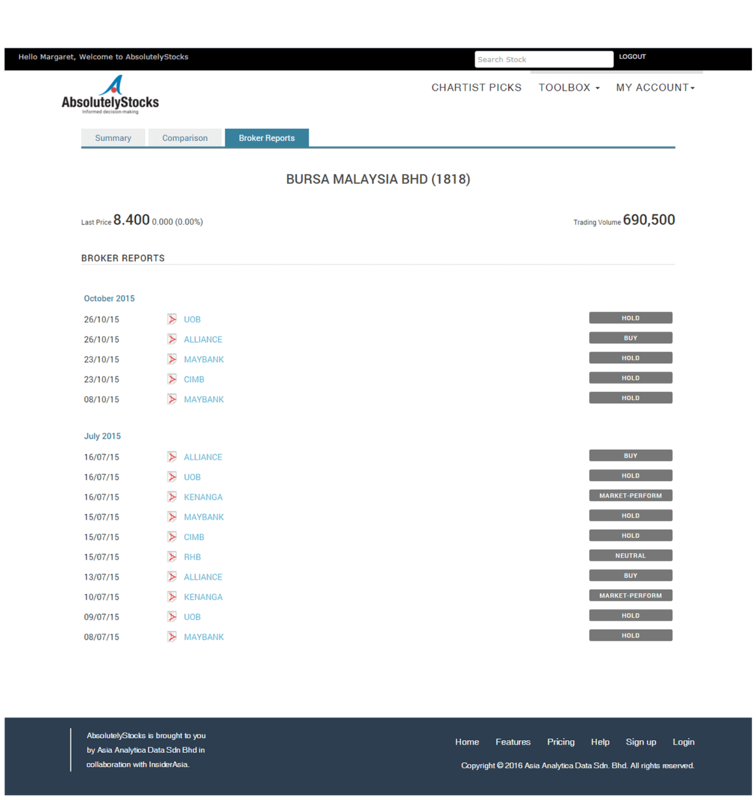 Our coverage extends to all companies listed on Bursa Malaysia and Singapore Exchange.